A new chapter in "Breaking Bad" is in the works, The Hollywood Reporter says citing sources familiar with the matter. "Breaking Bad" creator Vince Gilligan is working on a two-hour movie, though it remains unclear if that will be released theatrically or made for television. Gilligan, sources say, will pen the script, executive produce and possibly direct. "Breaking Bad" and prequel series "Better Call Saul" exec producers Mark Johnson and Melissa Bernstein are also said to be attached to the film project, which is said to follow the escape of a kidnapped man and his quest for freedom. Production is expected to begin this month in New Mexico. The New Mexico Film Office confirmed that a project with the title of Greenbrier is slated to shoot in in the region. 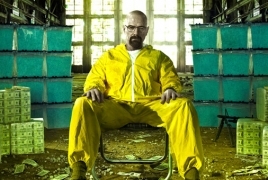 "Breaking Bad" became a critical breakout for AMC and ran for five seasons. AMC and producers Sony TV quickly greenlighted the prequel Better Call Saul as Gilligan's follow-up series. Saul, featuring Bob Odenkirk's small-time lawyer, has been renewed for a fifth season, which set to air in 2019. The "Breaking Bad" movie would mark Gilligan's first project to stem from the new three-year overall deal he signed with Sony TV in July. Sources said the pact is valued at less than $50 million as Gilligan is not in the same volume space as producers like Shonda Rhimes and Ryan Murphy, who both signed nine-figure deals with Netflix. A "Breaking Bad" film (of any sort) would be a boon for Sony TV, which, as an independent studio, has been fighting an uphill battle in an era when ownership has become increasingly important.